American Zach Johnson Wins British Open In 3-Way Playoff : The Two-Way It's the second major title for the Iowa native, whose breakthrough win came at the Masters in 2007. Jordan Spieth narrowly missed a chance at the playoff. 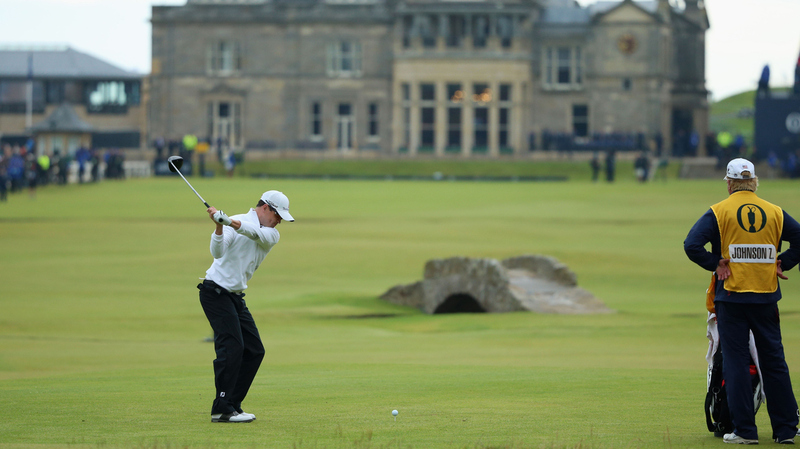 Zach Johnson won the 144th Open Championship at The Old Course in St. Andrews, Scotland, on Monday. He's seen here teeing off on the 18th hole in the playoff round. American Zach Johnson has added a second major title to his career, winning the British Open on Monday in a dramatic four-hole playoff. Masters and U.S. Open champion Jordan Spieth narrowly missed a chance to join the playoff, quashing dreams of a Grand Slam in 2015. "It's surreal," an emotional Johnson said after the win, adding: "I'm thankful. I can't play any better than I did. My wife is my rock." It's the second major win for Johnson, an Iowa native whose breakthrough victory came at the Masters in 2007. It came on a rainy day at St. Andrews, where Saturday's long delay over high winds forced a Monday finish. "I've come a long way since 2007," Johnson told ESPN after his win. "What this does, if anything, is it really puts things in perspective for me... I play golf for a living, and I'm grateful for that. It's a beautiful game." Noting the import of winning the British Open at St. Andrews, Johnson said, "This is the birthplace of the game, and that jug means so much in sports." He was in tears by the end of his interview, saying: "Gosh, I'm a mess. Sorry." The playoff pitted Johnson against Louis Oosthuizen of South Africa and Australia's Marc Leishman on four par-4 holes: 1 and 2, followed by a finish on 17 and 18. Johnson leaped to a one-stroke lead by birdying the playoff's first two holes. He gave a stroke back by scoring a 5 on the third hole, but his rivals did the same, leaving him one up on Oosthuizen and three ahead of Leishman as they teed off on 18. All three golfers scored a par on the final hole — with the most painful par coming courtesy of a missed putt by Oosthuizen that secured the Claret Jug trophy for Johnson. After four rounds of regular play, the tally for Johnson ran 66, 71, 70, 66, for a score of 273 (15 under par). Oosthuizen and Leishman matched that score, but it was just out of the reach of Spieth, who settled for a tie for fourth place alongside Jason Day. Spieth, 21, came into the final two holes with momentum, having converted a long putt for birdie on 16 that gave him a share of the lead. But his putting game didn't help him late, and he bogeyed 17 before hooking his drive left on 18. The approach shot that followed seemed to be on-target, but the ball spun backward down the face of the green. For Spieth, the biggest groans came on 17, when a playoff seemed nearly certain. Faced with a relatively short putt, his ball swooped around the cup, prompting gasps in the large and loud gallery. On 18, his attempt to save the hole with a long and challenging putt went just wide of the mark. "Wow.. Almost," Spieth tweeted moments after the finish. "Nothing quite like @TheOpen at St Andrews. We fought hard. Of Johnson, Spieth wrote, "Very proud of a role model and friend of mine."